The DJ Forry Company has been bringing the juiciest, best-tasting plums to kitchen tables around the country for years. Like all produce we bring to market, we insist that our farming partners utilize the latest, most up to date farming and harvesting methods to ensure only the best and safest California plums reach your table. It’s All in the Details. What better way to ring in summer than with sweet, juicy California plums. Sweet & Juicy is the key term here. As far as we’re concerned, there is nothing worse than biting into a beautiful plum and not have that wonderful experience of a burst of flavor and juice running down your chin. We take great pains to make sure that you are satisfied with every bite. Once our farmers determine that their plums are at the perfect stage of ripeness for harvest, our work has really just begun. Easier Than Ever. Why not try our new Forry’s Finest Grab N Go pouch? It’s a super-quick way to buy just the right amount of kiddo-friendly sized, tree-ripe plums. You might even want to try our Summer Fruit Trio. Its our new package that contains a combination of tree ripened peaches, plums and nectarines. Any way you go, there is no better way to nourish your family…with every bite. 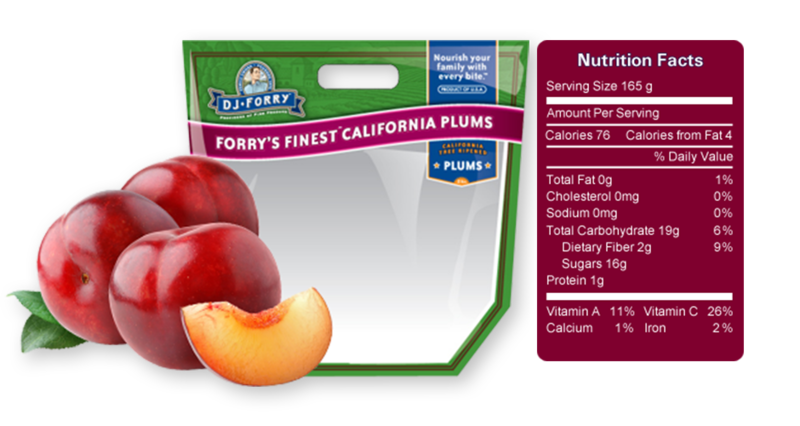 With Forry’s Finest new Grab N Go pouches, enjoying great tasting plums…is in the bag! Plums should be juicy and sweet with every bite. Once you get your fruit home, we suggest keeping it at room temperature until the fruit yields to gentle pressure in the palm of your hand. Refrigeration is not the best option until your fruit is ready to eat. Once your fruit is fully ripe just place it in the fridge for a couple of hours for a really cool treat. I bet your mouth is watering now. Vitamins: Plums are an excellent source of vitamin C. Just one serving gives you 26% of your total daily allowance. Plums are also a good source of vitamin A, packing 11% of your daily requirement. Plums provide 13% of your daily allowance of vitamin K which is good for helping to clot blood and in aiding calcium to strengthen your bones. Fiber: Not only do plums contain fiber, they also contain two other very important elements that aid in digestion; sorbitol and isatin; both of these elements are found in the skin of plums. Lutein and zeaxanthin which are good for the eyes. B cryptoxanthin which may help with aches and pains associated with arthritis. Panthohenic acid or vitamin B5 which helps the body turn food into energy. Potassium: To help with blood pressure. Fluoride: To help with strong bones and teeth. Iron: To help build strong red blood cells. As a bonus, the average size plum has only 60 calories. Like the peach, it falls into the category of a “Negative Calorie Food” meaning that your body burns more calories digesting a plum than it takes in from consuming it. Now that’s plum cool.